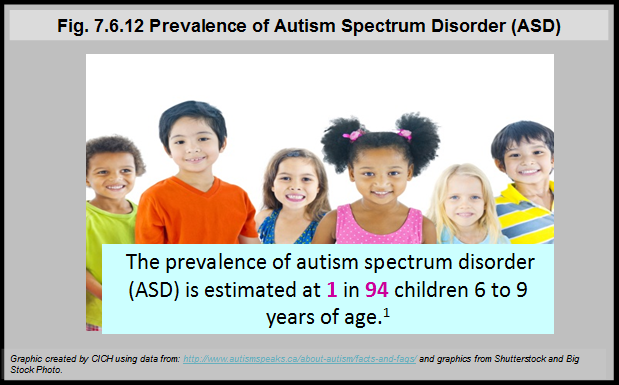 Source: CICH graphic created using data adapted from the National Epidemiologic Database for the Study of Autism in Canada (NEDSAC) reported on Autism Ontario Knowledge Base. http://autismontario.novosolutions.net/default.asp?id=133 -accessed June 21, 2017. ASD is caused by a combination of genetic and environmental influences. 1National Epidemiologic Database for the Study of Autism in Canada (NEDSAC) reported on Autism Ontario Knowledge Base. http://autismontario.novosolutions.net/default.asp?id=133-accessed June 21, 2017. 2Public Health Agency of Canada. Autism Spectrum Disorder (ASD) Published: (2015-10-22). Data Blog. http://infobase.phac-aspc.gc.ca/datalab/autism-blog-en.html-accessed June 26, 2017. Autism has a significant and lifelong impact on individuals living with the disorder, as well as their families.